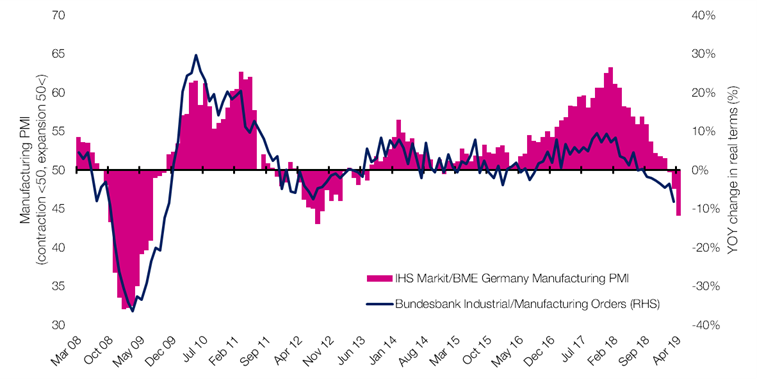 Last week saw the fastest contraction in German manufacturing order books and new business since April 2009. Thankfully, equity markets haven’t been too taxing with the US posting 16% gain year-to-date! Asset class returns in sterling and local currency are below; it was an extremely strong week for equities across the board last week as markets rallied on optimism over trade talks between Washington and Beijing, and new signs of an economic rebound in China. With the minor distractions of the UK’s seemingly endless withdrawal from the European Union and the US-China trade talks, you could be excused for missing the aggressive slump in Eurozone manufacturing output. While we’ve mentioned signs of a slowdown in the Eurozone a couple of times, last week saw the fastest contraction in German manufacturing order books and new business since April 2009. The deterioration in new orders has been primarily attributed to a weak automotive sector (to which Germany has a significant exposure), soft global demand, and uncertainty surrounding both the Brexit negotiations and global trade tensions. The lack of pressure on manufacturing capacity has had a knock-on impact on the German economy, leading to a drop in employment across the sector as employers have failed to renew contracts for temporary workers. Though only a marginal decline, it represents a break in trend following three years of solid job creation; such reluctance to extend contracts is an indication of further weakening in confidence towards the outlook for output. Worryingly, the collapse of German manufacturing is being mirrored across the continent; the aggregate PMI survey for the 19 Eurozone countries now show the sector to be firmly in contraction territory with only Spain showing a positive reading. So how has this impacted markets? 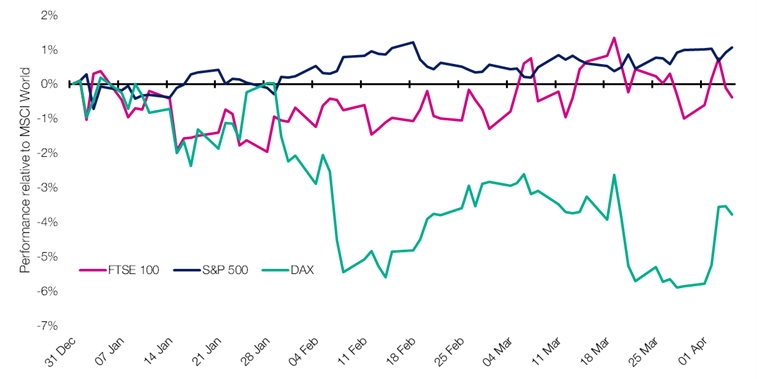 German equities (illustrated by the blue-chip DAX index below) have underperformed global equities year-to-date as the bite from a slowing manufacturing sector has weighed on sentiment. By contrast the FTSE 100, roughly equivalent in terms of international exposure to the DAX, has outperformed its German peer in part due to less exposure to both the struggling automotive sector and manufacturing more broadly. Fortunately, with China, Turkey and Russia – all major import-export partners for Europe – seeing their manufacturing sectors rebounding, it is hoped by many economists and market participants that the deepening rout in global trade may be starting to bottom out. Should this be the case, then European equities – particularly those with high exposure to the global economy – could benefit from a significant rebound. STAT OF THE WEEK: 7% – the forecasted boost to Birmingham’s GDP per capita if its bus journey times were as reliable at peak time as they are off peak (Open Data Institute Leeds).